⟩⟩⟩ HD encoder & streamer for live broadcasting platforms and Video-over-IP applications. Up to 1080p@60fps HD resolution. Very stable operation on multicast distribution on local area networks. Suitable for video-over-ip application through internet. Dual IP output streams at the same time with different resolutions, e.g. one for internet, one for LAN. All IRENIS encoders offer perfect image quality and stable system operation at an affordable price. HD Resolution 1080p, 1080i, 720p. Streams to Ustream, Atlas™, Wowza®, and Adobe® Flash® Servers. IRENIS SDE-16265 16 channel encoder enables the distribution of SD and HD tv/video content through IP networks in digital quality. Real time Linux® based multichannel SDI H.265/H.264 audio and video HD live encoder with 16 HD-SDI inputs and 16 IP outputs, each generating 2 different streams. IP protocols can be RTMP, RTSP, UDP, HTTP, HLS, FLV, ONVIF. Supports input and output resolutions up to 1080p at 60 fps. Streams to CDNs, Atlas™, Wowza®, Adobe® Flash® Servers, Youtube®, Twitter®, Facebook®, Twitch® live platforms. 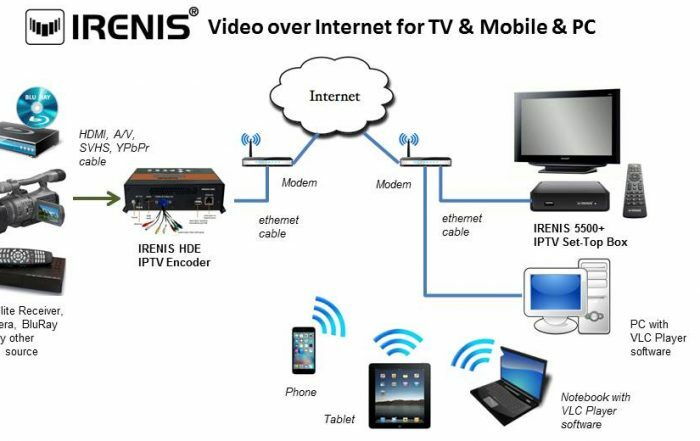 IRENIS SDE-16265 IPTV encoder is designed for TV signal distribution in excellent quality over LAN and INTERNET. H.264 (MPEG-4 AVC) and H.265 (HEVC) encoding is selectable. 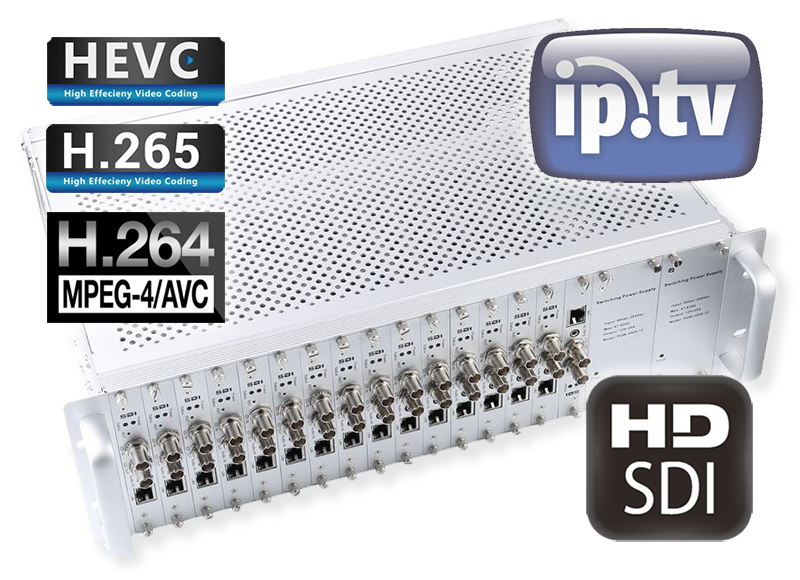 The H.265 (HEVC) compression technology features low latency and low bit rates for IPTV/OTT systems. The high-efficient bandwidth use saves bandwidth cost through all its resolution range. The embedded linux OS is stable and effective. Distribution of SD and HD TV channels through the IPTV/OTT network using state-of-art IP technology from almost any kind of video input. Excellent video and audio quality. High reliability. No regular service and maintenance need during operation. From 1 input signal, 2 completely different streams can be generated. The main stream can have up to 1080p, the second stream up to 720p HD resolution. It is possible to generate one H.265 and one H.264 stream from the same input at the same time. On screen logo and text insertion. Through HLS encoding feature, Android and iOS mobile devices compatible. Streamer for OTT platform providers for feeding the CDN with live video. Streamer for multicast IPTV distribution on LAN. Encoder for Video-over-IP applications. Suitable for use on Ka-Sat live feeds. Main Stream output resolution support: 1920×1080, 1680×1056, 1280×720, 1024×576, 850×480, 720×576, 720×540, 720×480, 720×404, 704×576, 640×480, 640×360, 608×448, 544×480, 480×480, 480×384, 480×360, 480×320, 480×272, 480×270, 400×320, 400×224, 352×480, 352×228, 320×256, 320×240, 320×180, 240×180, 176×144.